Regardless of the adventure you choose, you will begin your time at Branson Zipline and Canopy Tours with a brief orientation presented by one of our knowledgeable, certified guides. After learning the simple in's and out's of operating a zip line, you and your party will be escorted to the top of our Wolfe Creek Preserve by way of tram and prepare for the adventure of a lifetime. 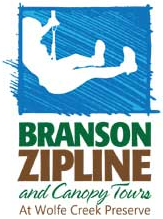 Branson Zipline is located directly off Highway 65, only seven miles North of Downtown Branson, MO.